The life and times of a half-Singaporean half-English lawyer living in Tiong Bahru from 2009 onwards. 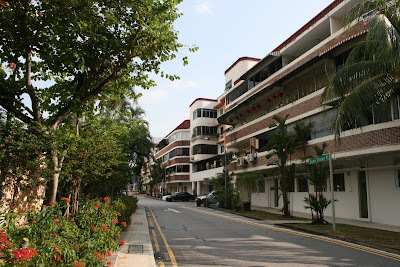 Tiong Bahru is situated in District 3, two MRT stops west of Tanjong Pagar on the western edge of the central business district, where CapitaLand, Google, eBay, and PayPal (to name but a few) have their head offices. Three hotels and one wine bar compete for your liquid dollars in Tiong Bahru, all of which have opened in the last 18 months. Halo at Wangz Hotel (+65 6595 1388 / 5 pm - midnight daily). A large metallic beer barrel landed in Tiong Bahru this year to the bemusement of some residents. This urban sculpture of gleaming aluminium cladding and asymmetrically-placed windows houses Tiong Bahru's best rooftop bar (Yes! it's not the only one. See below...). Complete with funky water features, a barman who knows his Sauvignon from his Semillon and an un-paralleled view of Tanjong Pagar, this is our firm favourite for a post-work wind down. Glass of house wine: $8.50. Highs: The view; the trendy styling. Lows: Only one choice of house white and it's a simple Chardonnay. Cafe Potion at Hotel Nostalgia (+65 6808 1818 / 7 am - midnight daily). An alfresco dining and drinking spot offering occasional soft live music to accompany your selected beverage. Thought has gone into crafting a decent wine list and offering things that remain unique to the area: a weekend brunch and a 52 inch plasma sports TV. Glass of house wine: $9.00. Highs: Well-priced, decent wine; delicious food (albeit portions are slightly small). Lows: The setting right next to busy bustling Tiong Bahru Road can be a distraction when the buses roar past. A poolside terrace bar is opening soon, so if they can replicate their good work down below, this should be a roaring success. Breeze Beer Garden at The Link (+65 6622 8585 / 5 pm – midnight daily). A long and thin rooftop bar without a view provides some solace from the busy road below. Simple drinks abound; our barman was a bit blur like sotong when it came to ordering anything more complex than a wine or beer. Glass of house wine: $9.00. Highs: The simplicity. Lows: The simplicity. Wine Wise at 57 Eng Hoon Street #01-86 (+65 6227 2118 / 11 am – 2 pm, 6 pm – 10 pm). Despite the charm of drinking "straight from the barrel", it will take more than a squint of the eyes to imagine yourself in a rustic French vineyard. Here, wines are served tasting not of oak, but plain old wood with just a hint of chipboard. Accompany what has been to date the worst fermented grape juice ever to pass my Eurasian lips with hard seating and (when we were there) psy-trance, one has to wonder whether this really is a drinking establishment or if it's just for "show". Highs: The offer for me to 'create my own bottle' by mixing wines from the barrels and designing my own label - a sure winner of a gift... for someone you despise. Lows: Please see above. People travel from all over Singapore in their droves to attend the famous Tiong Bahru market and its surrounding standalone eateries. Just don't forget to chope your seats. 7 Original Tiong Bahru Fishball / #02-20 (Craving fish balls or sotong balls on a stick? How about fish cakes shaped like actual fish? This stall has it all and more and the guy serving it has a whisker as long as my index finger. That means he's been around for a while and so has this stall. Rocking. Le Le Pot at Blk 58 Seng Poh Road #01-23 (+65 6222 9442). Our favourite place for a constantly sumptuous and affordable steamboat feast. The price gets you a buffet selection from the a la carte menu, which is comfortingly always the same. Added to this, we have never had any gastronomic illnesses from eating there (unlike our experience at Tin Yi Gang Shi Huo, a few doors down on Seng Poh Road) and the owner is a former TV extra, so the place is adorned with photographs of him dressed in various amusing costumes. If you're lucky, when you go up to pay your bill, you might just meet him! Por Kee Eating House at Blk 69 Seng Poh Lane (+65 6221 0582). Open since 1996, this eatery offers both alfresco and air-con dining, serving up live seafood from its wall of tanks next to the car park. Enjoy the achar appetiser whilst you peruse the enormous menu. No one in the area offers better meaty spare ribs ("Champagne Pork Ribs - short") which come coated in a sticky blackened sauce to die for. Order their live prawns (with your choice of sauce) and get stuck in with a side of spicy kang kong. Finger bowl essential. Ting Heng Seafood Restaurant at #01-03, Blk 82 Tiong Poh Road (+65 6323 6093). No frills, alfresco steamboat haven for those hungry enough to tackle its large menu. Open until 4 am, you might find some of the waitresses get a little lost in translation. This is nothing that a little pointing won't fix. Loo's Hainanese Curry Rice at 57 Eng Hoon Street #01-88 (+65 6225 3762). Curry that takes three days to cook puts Jamie Oliver's slow-roasted lamb recipe to shame. Arrive early. Chope seats. Queue. Get barked at by one of the aunties. Quickly select your chosen dishes that will be served with boiled rice. Four dishes will easily feed two hungry brunchers. Roadside seating, delicious home-cooked dishes. An institution. Sin Hoi Sai Seafood Restaurant at 55 Tiong Bahru Road (opposite The Link) (+65 6223 0810). Famous for Chilli Crab, it has a wide selection of crabs from different part of the world as well as the opportunity for you to try geoduck, by far the weirdest sea creature I have ever had the mild-pleasure to ingest. 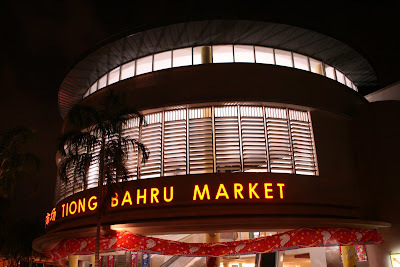 Tiong Bahru Market - #01-134 - the best place to buy fish and seafood. Run by a husband and wife team, if you frequent them long enough, answer their searching questions (they know my job, my ethnic background, where I live, but have yet to ask my name), you will get good discounts on their excellent selection. Tiong Bahru Market - #01-171 - Stanley's Fresh Chicken & Duck Suppliers (+65 8161 2178). By far and away the best kampong (read: free-range) chicken money can buy. Aunties, Japanese expat wives and me queue up every weekend to grab Stanley's poultry served with a cheeky grin and a witty quip before it all runs out. He is usually cleaning up his stall by 11 am. The early marketer catches the bird. If it's dessert you're after, look no further than Centre PS, at 78 Guan Chuan Street #01-43, for exquisitely delicious French macaroons, crumbly biscotti, delicately designed cupcakes and melt-in-the-mouth cheesecakes of varying flavours. Perfect presents to take over to your favourite friend's dinner party for something to wow the palette during the coffee course. There are a host of stalls on the outside sections of the wet market that sell virtually everything else you need for your weekly shop (bar fresh cow's milk that you can get from the 7-11 opposite). If you're in doubt, buy something from Stanley and ask him what you're after. His wife will show you where to get it. Zouk is but fifteen minutes' walk away (OK, twenty if you're half cut and walking the squiggly way home). Famed as being one of Singapore's longest standing and best quality nightclubs, the crew have worked tirelessly to put Little Red Dot Clubbing on the map, attracting top names approximately once a month. Dig your own rave. White Canvas Gallery is just a few months old and, when it fully launches, promises to enhance the local cultural offering. Tiong Bahru is not just about beautiful architecture any more. Enrico Furlan, the owner, has kitted out the gallery space with some highly unusual but rather special items: vases made of multi-coloured silicone, golden tortoises, over-sized pulled plastic flower sculptures and animals made of metal sheets and wires are the current exhibition. Highs: Exuberant surroundings, intriguing artwork and a wonderfully tranquil atmosphere. Lows: Why can't I live there? Alvin Yeo (Estate Agent for Tiong Bahru) maintains a regular blog full of local tidbits to keep you amused. It's well written, often witty, and a superb insight into life in this golden village. If Tiong Bahru's for you, he's your man. I think you captured the mood of the estate with the Hollywood angle!